Here in Canada we are very Blessed. If we need something it is usually just a phone call away. Hungry? Call for a pizza and it arrives at your door in under an hour. Outdoor maintenance? Landscapers, lawn mowers and grass aerators are happy to show up and beautify your yard. Building project? A quick ring to Rona or Home Depot and you will have more lumber and nails than you know what to do with. God forbid; but a house fire or medical emergency? Dial 911 and there will be a team of well trained and equipped firefighters at your door in a matter of minutes. Unfortunately this is definitely not the same type of scenario that plays out in developing countries. In an emergency, not only do most homes not have telephones but even if they did, often they would have no one to call. In countries such as Chile, Bolivia, Guatemala and Ecuador the only "call" they make is to shout for help from their neighbours. If they are lucky, word will reach a shop that has a telephone and a call will be made to the local volunteer fire department. Unlike in Canada, this is still no guarantee that everything will be okay. In developing countries it is a huge source of pride to be a volunteer firefighter (as it should be everywhere) but sadly, it is usually because of the extreme danger involved. Due to the lack of expensive equipment and personal protective gear most often firefighters in third world countries can be witnessed putting their own lives at risk on a daily basis, showing up to burning structures in antiquated vehicles wearing only their regular day to day clothing which might consist of jeans, a t-shirt and sneakers. They would be lucky to have a hard hat and heavy jacket but certainly nothing like breathing apparatus or insulated boots. And certainly nothing that even comes close to the firefighting vehicles that we are used to seeing. This is where an Edmonton based organization called CAFSA (Canadian Aid for Fire Services Abroad) and President and CEO Victor Fernandez steps into the gap. Victor, who is still an active firefighter in Edmonton, saw all the lightly used equipment that was being retired due to Canada's stringent safety standards going into landfills because they could no longer be used here, and realized they could have a much needed second life in developing countries. When Leduc County Fire Services learned about CAFSA and their mission they got on board right away. 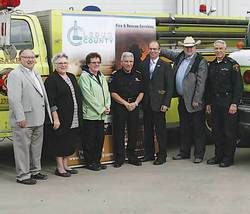 Not only has Leduc County donated personal protective equipment but in April of 2011 they donated a decommissioned pumper truck to CAFSA and that truck is now on duty and saving lives in Penco, Chile. "It is amazing to see how much our old gear and vehicles are treasured when they arrive at their new homes," said Victor. "I have seen grown men burst into tears as trucks are taken off of ships and placed onto the piers. These vehicles are treated like precious jewels, constantly washed and polished to within an inch of their lives and anyone caught slamming a door on them is subjected to stern reprimands!" Victor shared with a smile. Seeing the difference that CAFSA makes in partnership with donors from Canada, Leduc County Fire Services once again made the decision to donate not one, but TWO decommissioned pumper trucks to the organization. So on Oct. 8th Victor was on hand to gratefully receive the vehicles and informed everyone that these trucks would be loaded onto a freighter in the next several months and making their way over to Bolivia. "I am pleased to once again accept a donation from Leduc County Fire Services," said Victor. "The generosity of departments across Canada enables CAFSA to help firefighters in less economically fortunate countries to protect infrastructure and lives in their communities." "The trucks have no value to local departments," stated Gerald Haakenson, fleet and equipment maintenance coordinator with Leduc County Fire Services. "But they make a world of difference to fire departments in developing countries. They have nothing down there in a lot of these places so they are very grateful our equipment." To discover more about the important work that CAFSA does, or to make a donation to this organization, please go to their website at www.cafsa.net.